I would call it the ankle bone, and that is how I would refer to it when consulting my doctor. It is just the end of the fibula. The medical term for it appears to be the lateral malleolus. Since you appear to be asking for the name of the space underneath the ankle bone, I will have to disappoint you. There may be a medical term for it, but I'm not a doctor. 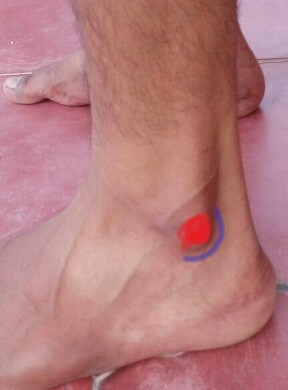 In clinical anatomical terms, this place that you pointed out is called lateral malleolus. I have attached for you illustration. It is called lateral, as it's common in anatomy to call the outer part / direction- lateral while the inner part / direction is called medial. 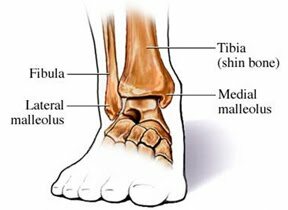 Malleolus is the name for the distal part of the fibula bone. 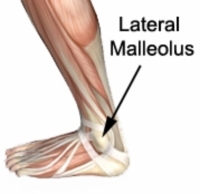 This name (malleolus) came from Latin meaning hammer, because its shape. The term ankle is more general and it is a larger erea includes the medial malleolus in the second side, that it to say, on the opposite site that you pointed on. In the bottom line it includes much more erea than you wanted to point. See here for more details. Not the answer you're looking for? Browse other questions tagged vocabulary terminology image-identification or ask your own question. In sushi restaurants, what do you call the one taking reservations? What do you call this thing? “bag”? What do you call this tailor clip in English? What do we call this part of the room? What part is called the crust?